Join us for our second Irish Language & Culture Weekend of 2018 in our 8th year of supporting intensive Irish language learning. DID YOU KNOW? Ireland has declared 2018 the year of Irish Language! 7pm to 9pm(ish), bring your instrument and/or singing voice. Brady’s has real pub feel and an Irish Chef/Owner. Excellent food and drink selection. This weekend will accommodate three levels: absolute beginners*; beginning speakers**; intermediate speakers***. Taught through English, this introduction to the language is suitable for anyone with no knowledge of Irish. Join Renata Rua as she walks you and your fellow learners through some basic conversations, and uses them to teach pronunciation, comprehension and even some spelling & grammar. You will end the weekend having learned how to converse at a very basic level! This course, taught through English sprinkled with basic Irish, is intensive language learning structured around communication and key conversations. Brian Ó hAirt will work with you on an individual level to build your comprehension and ability, using conversational forms and models and introducing new verbs and vocabulary as the individual learner is ready for new material. Indulge your passion by spending as much of the weekend as possible in Irish (some minor infractions allowed)! Tomás Jeffers will help you increase your language ability and build fluency by teaching you methods of HOW to learn from the language itself. Push yourself to become a more active communicator by learning to engage your own language skills at a more advanced level and interact with fellow speakers in a clear and effective way. RSVP is a must in order to facilitate the best weekend possible for you. Please, no walk-up registrations. More details available upon registration. Email [email protected] to RSVP and to organize payment via cheque, PayPal, or credit card. Cost of the weekend is $150. Member Price is $120. * Absolute beginners have no language skills whatsoever. **Beginning speakers can respond to simple questions dealing with common, everyday interactions. You rely on lists of words and memorized phrases, and can satisfy a very limited number of immediate needs. ***Intermediate speakers can participate in simple, direct conversations on generally predictable topics related to daily activities and personal interests. You can initiate, sustain, and bring to close a number of basic, uncomplicated exchanges, often in a reactive mode with some mistakes. You can also create with the language by re-combining sentences and familiar structures. Tom Jeffers is a native of Dublin, where he attended preschool, primary school and secondary school all through Irish Gaelic. 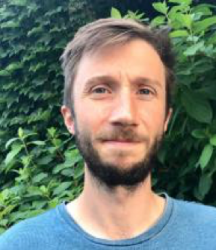 Tom holds a bachelor’s degree in history and Irish Gaelic from University College Dublin and a Higher Diploma in Translation and Editing from Maynooth University. He came to Minnesota in 2008 as a Fulbright Foreign Language Teaching Assistant at the University of St. Thomas. Since then, he has moved between Ireland and Minnesota, teaching, translating and editing. He currently works as an in-house editor for a digital media company in Minneapolis. Brian Ó hAirt is a native of St. Louis, Missouri. He received his BAs in Linguistics and Anthropology from UW-Milwaukee in 2003. He also holds MAs in Music and Irish Studies from the University of Limerick and the National University of Ireland–Galway. 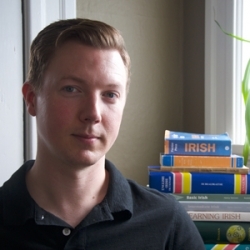 Brian has taught at Irish language events throughout the United States and most recently has developed language learning games through Language Hunters, a non-profit organization in Portland, Oregon. He has a strong passion for building minority/heritage language communities here in the United States. 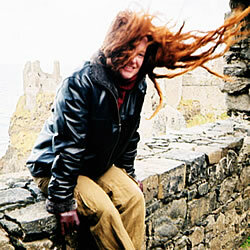 Renata lived in Ireland for 10 years and studied the language extensively, earning a B.A. in Celtic Studies from University of California, Berkeley, and an M. Phil. in Irish Studies from University College Dublin. She has spent time in the Donegal and Galway Gaeltachts, and organizes Irish Language Immersion Weekends at the Irish Center.